Students on the course are based at 32 football club learning hubs across the UK, including Southampton FC, Wigan Athletic FC, Derby County FC and Wolverhampton Wanderers FC. The degree was designed in conjunction with the English Football League Trust to identify the type of skills and qualities that are required to work within professional football clubs community departments or national governing bodies in areas such as social inclusion, community coaching and football development. The course is delivered through blended learning, combining traditional face-to-face teaching with online delivery. Students only attend the University in person for short residential periods (six days a year), spending most of their time learning on the job at their professional football club. This unique delivery framework combines the benefits of a full-time HE degree programme with those of a real-world working environment and integrates the vocational qualifications necessary for employment into the curriculum. Rob Griffiths, Academic Subject Manager for Football Development and Coaching, said: “We are really pleased that the degree has been shortlisted for a national award. It is a unique degree and one that was designed to enable students to remain based with their football clubs for the majority of the time. The winners will be announced at the THELMA Awards ceremony on Thursday 21 June. 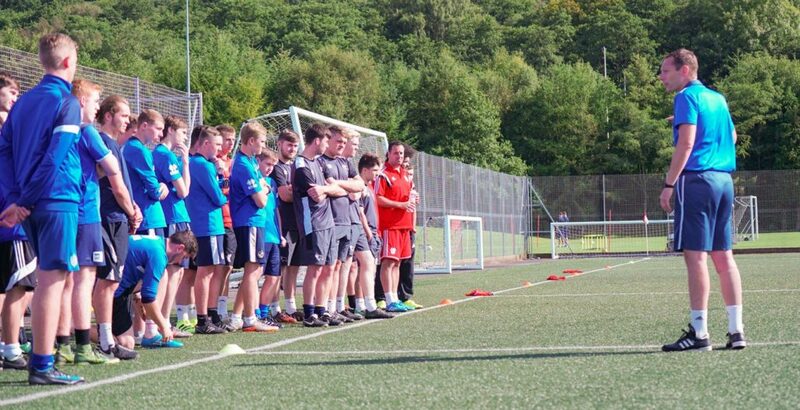 To find out more about the USW Foundation Degree in Community Football Coaching and Development click here.